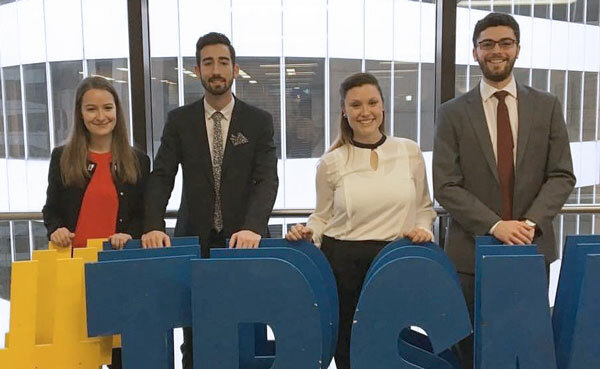 The HEC Montréal team took first place in the Ted Rogers Ethical Leadership Case Competition, held on November 19 at Ryerson University in Toronto. BBA students Andrew Coffey, Audrée Lavoie Archambault, Charles-Ely Legris and Aurélie Michaud will share a $4,000 prize. They were coached by Jean-François St-Pierre, Director - HEC Montréal Student Relations. For the first edition of this competition, teams had to analyze complex transparency issues in an international business context. The eight teams from business schools across Canada had one week to analyze the case and prepare their presentation to a jury of top business leaders and journalists. Photo: Aurélie Michaud, Charles-Ely Legris, Audrée Lavoie Archambault et Andrew Coffey.